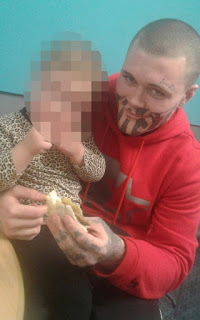 PM of NZ: "it's not gang-affiliated"
That's not what this pic shows. Just another mob member that should be locked up forever, not out after 2 years for armed robbery. And "had been inebriated when his cell mate - who is also his brother - gave him the tattoo, while he was completing a two-year sentence in prison for an aggravated robbery charge". Apart from the initial sentencing by a dud judge, that in itself just raises so many questions about what is Corrections doing on their watch? But, on another better note, obviously his bro has some tattooing skills. And from fb, "I don't have a CV as yet". I'd say every employer in NZ is now well aware of the contents of your short CV.